With a keen interest in the state budget and Virginia’s fiscal future, local government officials traveled to Richmond to attend the VACo/VML Finance Forum on January 8. 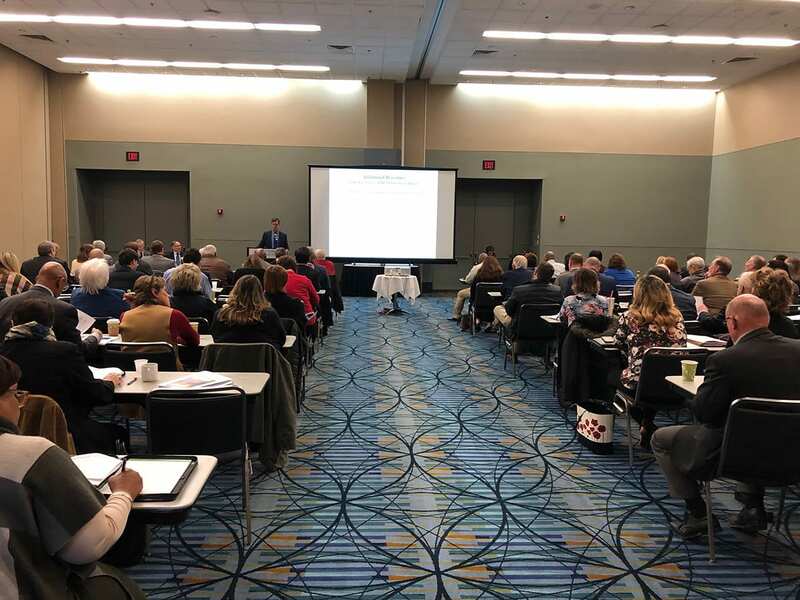 County leaders heard from experts about state spending, politics and the state budget, the Northam Administration’s spending proposals, and new budgeting issues on the horizon. This year’s event featured six speakers, each bringing a wealth of knowledge and insight about the state budget and how spending policy impacts local governments. Attendees first engaged with Joe Flores, Deputy Secretary of Finance, as he shared an overview of the Governor’s budget amendments, which include additional spending in the areas of K-12 education and the Medicaid program, as well as deposits in the Revenue Reserve Fund. Jim Regimbal, VACo Consultant and Principal at Fiscal Analytics, Ltd., then provided analysis of how the Governor’s budget amendments could impact local governments in the upcoming year. Politics and elections, ever present in policy forecasting, were the subjects next discussed by Richmond Times-Dispatch Columnist Jeff Schapiro, who gave insight as to how Virginia’s political structure has changed over the past several years. He also spoke about how those changes have brought policy variations, like the Medicaid expansion of the last session, and what new and old legislative proposals may be in front of us in 2019. Analysis of Health and Human Resources spending, always an important topic to the Commonwealth’s localities, was presented by Mike Tweedy, Legislative Analyst on the issues of Health and Human Resources at the Virginia Senate Finance Committee. Tweedy shared highlights of the 2019 budget – the forecast for Medicaid spending, the impact of Medicaid expansion legislation, Community Behavioral Health Services spending, and state mental hospitals. Steven Marzolf, Director of Integrated Services Program at the Virginia Information Technologies Agency, communicated information about the next generation of Virginia’s 9-1-1 System. Marzolf delivered a presentation detailing the challenges of the current system, including older technology and confusing networks, while also presenting information about the future of this critical system that will include increased flexibility and faster communication of important data to first responders. Capping off the day was Kristen Dahlman, Senior Policy Analyst at the Virginia Department of Housing and Community Development, who enlightened attendees with an overview of Virginia Opportunity Zones, certain challenged areas where investors can receive tax benefits in return for their investment in local businesses or properties. Dahlman provided information about the creation of these zones, how areas qualify for the program, and what type of investments may be eligible for tax incentives. The Virginia Association of Counties thanks all speakers and sponsors for their time and attention to the needs of local government. We also thank our attendees for making the trip to Richmond, and for their strong interest and enthusiasm for this event. HOW DO THESE BUDGET AMENDMENTS AFFECT LOCAL GOVERNMENTS? HOW WILL THE NOVEMBER 2018 ELECTIONS AFFECT THE 2019 LEGISLATIVE SESSION? ARE YOU PREPARED FOR THE NEXT 9-1-1?